Only two more legends remain on our list! The legend we are looking at today is one of the most exciting and prolific players of the past decade. He’s big, strong, fast, and has one of the best shots in NHL history. Meet Washington Capitals forward, Alexander “the Great” Ovechkin. Ovechkin is one of the most publicized hockey players we have so most people are already well aware of what makes Ovechkin great. He’s got a great shot, shows a lot of emotion on the ice, and seems to just love playing the game. What I want to do today is try and show some of the more intricate details, things that aren’t easily seen at full speed. After I finish, I hope you all will have a greater appreciation for exactly what Ovechkin does that allows him to be the goal scorer that he is. Before we get started, here’s a little bit of background on Ovechkin. Ovie has 365 career goals, 125 powerplay goals, and this season, he’s tied for 1st in goals with Tampa Bay’s Steven Stamkos, another Living Legend. Ok, now you’re ready for me to jump in. You are probably wondering what the heck I mean when I say “the feet”. In hockey we watch the puck, the other players, but rarely do we watch a player’s skates. Ovechkin makes it a little easier to watch his skates with the outrageously colored laces he puts on them, but still, we don’t watch enough. The area where this truly makes a difference is on the powerplay. When a team is on a powerplay, they have more room to operate with and goals come from how that team chooses to use the open ice. Ovechkin’s feet never stop moving on the powerplay. He reads the defense, rotates up to the point, slides down to the goal line, slides into the slot, and more. This constant movement makes it nearly impossible for the penalty kill to account for him. This is how Ovechkin gets himself free to score the easy tap-in goals. I guess that’s why Ovechkin has ranked in the top ten in powerplay goals in 7 of his 8 seasons. Below are a couple videos of some of his powerplay goals. I’ll break down one of the goals, and in both videos I want you to watch his skates and how he rarely stops moving. 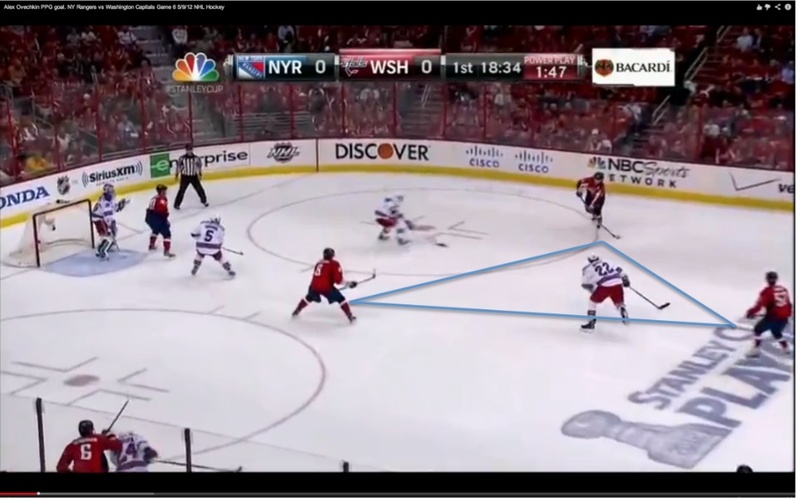 Another thing I want you to take note of in these videos is the “triangle” and how Ovechkin continually adjusts to form the triangle. 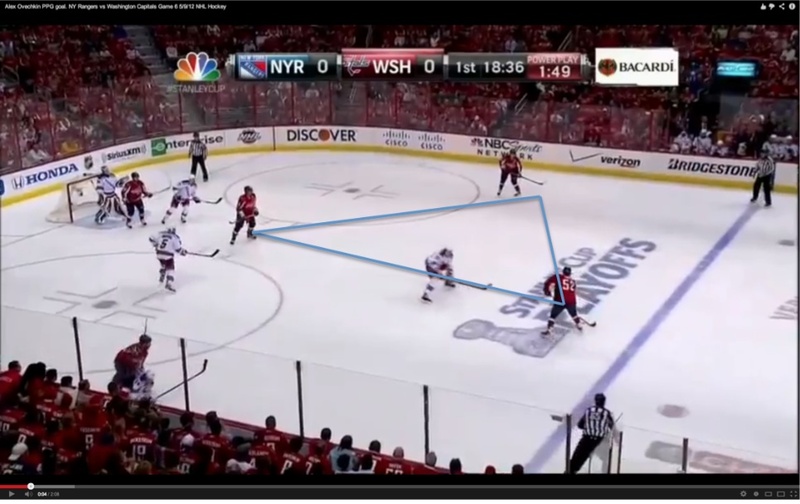 A major key to the powerplay is forming a triangle with three players. This puts two players in position to receive the pass and makes it easier to set up one-timer plays. This triangle is also designed to counter the “box” that penalty killers form by placing players in open spaces in between defenders. 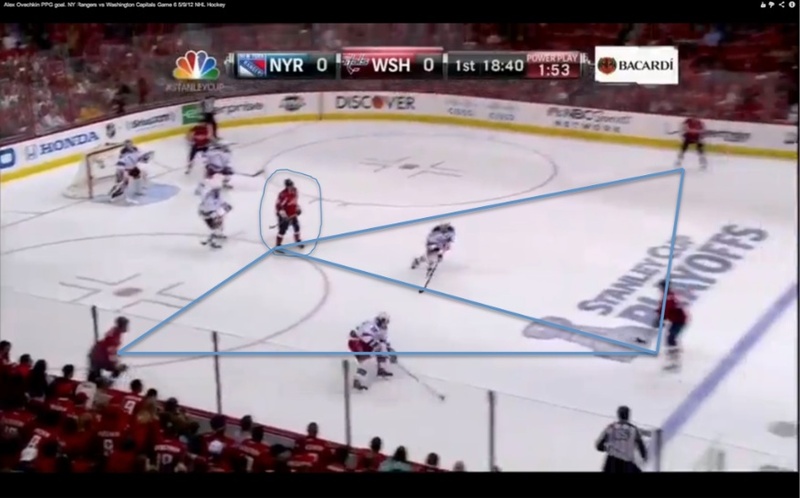 Pay attention to how Ovechkin always moves both his feet and his stick to be in perfect position for the triangle. Ok so check this first frame. Ovechkin is circled in the slot. I’ve drawn the triangles to show you what I’m talking about. The puck is currently at the point and you can see that by setting up the triangle, the defenseman has 3 different passing options. Ok so fast forward a couple of seconds. Capitals defenseman Mike Green is getting ready to pass it to the other point. Ovechkin is still giving Green an option to shoot for a deflection by facing him with his stick in position. Note how the triangle still remains intact. Ok this picture is absolutely crucial. The pass has gone across to the half-boards and Ovechkin is reacting to that pass. He has now turned to face his teammate with the puck and what I want you to note is the distance between the top New York Rangers’ forward and the Rangers defensemen in front of the net. Ovechkin knows that he has a ton of ice to work with so watch how he uses his feet to create a passing angle for his teammate for a one-timer. As I mentioned previously, note how Ovechkin has drifted back into that open ice. The Rangers’ forward at the top hedged too hard and was not able to recover to take away the pass. The defenseman in front of the net got caught down too low in his zone to pinch up in time to cut off that pass. However, in order for that pass to get through, Ovechkin has to drift back into that open ice. If he stays where he was initially, that pass gets taken away. It’s the constant movement that gets Ovechkin into the perfect scoring position. End result? Goal. This goal is another perfect example of how Ovechkin moves his feet to find the open area on the ice. The puck just seems to find him there and bang, it’s in the net. In today’s NHL it’s incredibly difficult to score goals. The goalies are more athletic, the pads are bigger, the skaters are bigger and faster. Now more than ever, it’s so important to get traffic in front of the net. If the goalie sees the shot, he’s going to make the save. It’s almost like cherry-picking for the goalies now. Ovechkin recognizes this. That’s why he has gotten incredibly good at using the opposing defensemen as screens for his shots. Below are a couple of great examples of how Ovechkin does this. This video is a phenomenal example of how Ovechkin is so good at using the defenseman as a screen. Detroit Red Wings’ netminder Jimmy Howard has absolutely no chance of seeing this shot as Ovechkin shoots the puck through the legs of the Red Wings’ defenseman. You can clearly see how Ovechkin purposely fires the puck right through the legs of the defenseman. By doing this, it makes it extremely difficult for the goaltender to pick up the release of the shot. That split-second is the difference between a blocker save and a goal. Here’s another great example of Ovechkin using a defenseman as a screen. It’s just about impossible for a goaltender to make this save. As I mentioned already, it’s incredibly difficult to score in today’s NHL and players have to use all the tricks in the bag in order to get those coveted goals. Another trick that Ovechkin has perfected is changing the shooting angle on a goaltender a split-second before he releases the shot. It’s very hard to show on video and on frame-by-frame analysis so I’m going to try and describe the phenomenon as best as I can. Essentially, Ovechkin will come down the ice and he will extend his stick far out and to the side of his body. Then, in one motion, Ovechkin will curl the puck about 6-8 inches closer to his body and fire the shot. This adjustment of 6-8 inches changes the angle that the goaltender needs to be playing. A goaltender’s job is to take away the angle of the shot and when Ovechkin changes the angle by 6-8 inches, the goalie does not have a chance to react to that change and therefore, there is usually a couple of extra inches to shoot at for opposing players. Below, I’ve put an instructional video that better explains how to change your shooting angle and why it’s important. 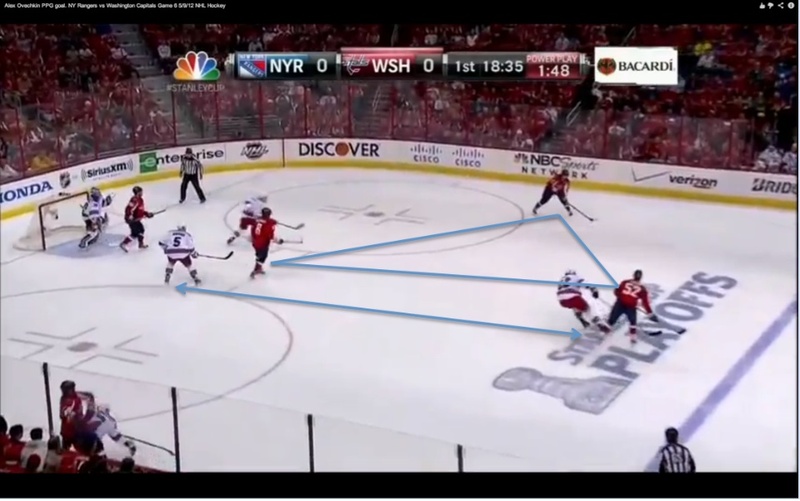 Below that, you’ll find a couple of examples of Ovechkin changing the shooting angle. This is a great example of Ovechkin pulling the puck in just before he releases the shot. And this is a beautiful example of Ovechkin pushing the puck out just before releasing the shot. As you can see, there are so many intricate details that go into scoring goals. It’s not as simple as just putting pucks on goal. There are shooting angles, passing angles, triangle formations, spacing, timing, and so much more involved. 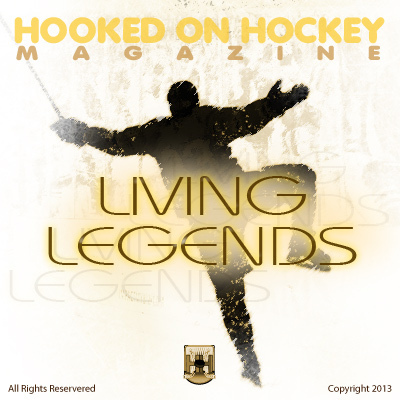 Ovechkin has mastered so many of those different skills and combined them to form an unstoppable scoring machine. The guy has 365 goals in 593 games, giving him 0.616 goals per game. That mark is the 6th highest mark in NHL history, just a shade above Wayne Gretzky, and a tad behind Pavel Bure. The man is highly talented, incredibly gifted, and will continue to bless us with his jaw-dropping goals for years to come. That is why Alex Ovechkin is a Living Legend.